Season's greetings to our supporters and friends! It's Carl here taking care of the update duties this month, keeping you abreast of the latest happenings from the SSR camp. For starters, the album is well underway and already sounding like it's going to be a monster. Lee and I have already laid down most of the basic tracks. This involved much wailing and gnashing of teeth, (mainly by me), while Michael will be spending his Christmas holidays surrounded by guitars and toys making lots of noise in the studio. For him, it's a home away from home. A reminder to everyone about the radio show that we are hosting at the moment. You can catch 'The Edge' every Thursday 10pm - midnight on Pure Radio 87.9fm. We'll be playing some of our favourite tracks by all sorts of bands and artists. There'll be some 'live in the studio' acoustic noodling along with us just basically talking complete waffle. Good laugh though. Well worth a listen. The final show is broadcasted on Thursday the 16th of December. Don't miss it! We had a great time at the Thatched House on Friday the 26th of November and it seems everybody else did as well judging by the feedback. Check out their new website. Looking forward to playing there again in the New Year. Checkout 40,000 volts internet radio, link on links page, taken from Tangents, the song Sacramento in Spring is featured on their play lists; why not send in a request for it. So anyway, enjoy the festive season and we'll see you next year! Hi, it’s Lee with a band update. Where do I start? 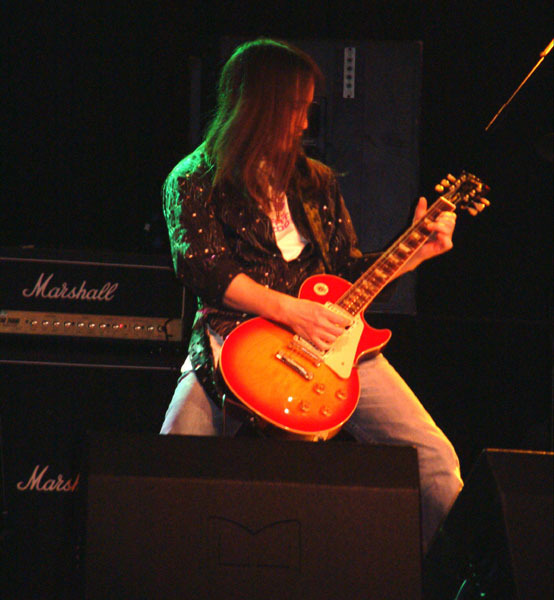 Playing with Wishbone Ash (14/10/04) was a major buzz especially for my self; being a fan and such like! The whole evening was fantastic, and the crowd were very responsive which made it extra special for us - we sold quite a number of our CD’s and had a chat with quite a few of you guys - thanks very much! Another highlight for the band was the Glass Barrel in Atherton (16/10/04). The new landlord, John, has made great improvements since he took over including a new stage and also in-house lights which always adds to the atmosphere. 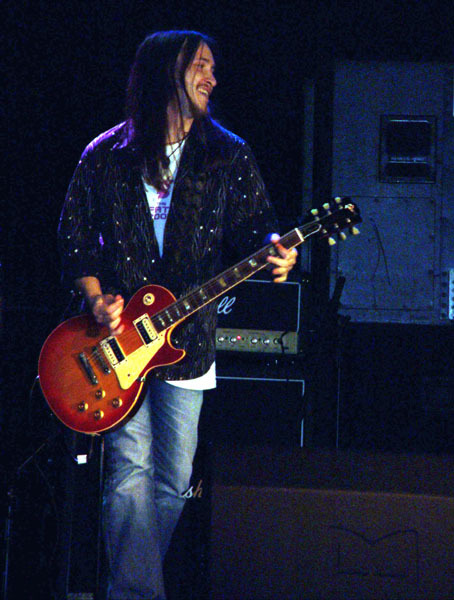 Again, the crowd were plenty and vocal, and after the rush for us playing with Wishbone Ash (getting to the gig early, waiting to get a sound check etc), the band were relaxed - some woman even commented that Michael looked like Johnny Depp! Must be something in the beer I fancy! More like Johnny Ball! Regular visitors to the site must have noticed that we haven’t played many other gigs recently - don’t panic! I'll explain. We are concentrating most of our time and efforts recording our debut album. This is proving very exciting for us as it will also be the first electric collaboration featuring myself; we recorded 'Tangents' last year in which all three of us played on but it was an acoustic EP ,this one will have all our usual trademarks and plenty of balls! The album will be recorded at The Shed and produced by the band and John Slater who has recorded and produced the SSR on many occasions, so we’re really looking forward to the album. Next year, we’re hoping to be moving more onto bigger things regarding our live shows. We will still be playing locally, of course, but including festivals further afield and more widespread gigs. Don’t worry, we will still be playing our old haunts! 2005 should be promising for the band and what we need is for you guys to give us your continuing support and who knows! The Edge as it will be called will feature all the different styles of music that the band listen to, rock, jazz, blues, folk etc, we'll be playing music by our favourite artists as well as special live acoustic numbers performed in the studio by the band. We intend to play music by artists that you may not be to familiar with, try to educate the masses so to speak, as well as classic material that everybody should have in there collection, plus we'll play music by some of the bands we've had the opportunity to perform with and all the stories that go with them, all in all a great music fest! There will be 4x2 hour shows aired weekly on a Thursday night throughout November, from 10p.m. till 12p.m. Pure Radio can be found 87.9 FM and more info can be found on their website www.pureradio.org.uk. So don't forget to tune in and if you like the show tell all your friends and send us an e-mail to let us know! Hi there, been a while since our last update so here we are again to let you know what we¹ve been up to and what¹s coming up next! Firstly our little excursion to Cornwall! It turned out to be a very eventful trip for the band and fun and games were enjoyed by all! Arriving there we hit the bars to celebrate Carl's birthday, an evening of drinking and hilarity ensued, but to be honest we all got so clattered, the details of what exactly happened are somewhat sketchy, so we move on to next days hangover, and a trip to Lands end. Finally reaching lands end, a very nice and incident free afternoon was had by all. Carl spent the afternoon being our resident David Bailey and photographed everything (we'll post some of the shots up a.s.a.p) and after a bit of hair of the dog we all felt much better and ready for that nights gig in Camborne! The venue itself was a rather large bar underneath Tyacks hotel. Although temperatures were soaring and the venue turned into a steam bath we played it hard and heavy, and even played a few numbers requested from the audience (a rather blustery version of Led Zeps Communication Breakdown was one I recall). After the gig our roadie drove our friends back to our hotel whilst we packed up the gear, then returned to pick us up and we all repaired to the hotel bar for a few drinks. Not quite satisfied with only a few drinks (the hotel manager not overly impressed with our slightly boisterous behaviour, closed the bar), myself and Lee were invited to a friends room for more drinks and an acoustic jam. After a few more beers I got my acoustic guitar, Lee his acoustic bass and we jammed through a few numbers to our friends Kilroy and James, very enjoyable! That is until a knock at the door, yes it was our friendly hotel manager! Kilroy answered the door to a rather stern 'Stop now or leave.' We thought a slight over reaction (people usually pay good money to have us perform!) But seeing as we didn't want throwing out we all made a quick retreat to our respective rooms. The next morning Lee's wife Vic congratulated us on a splendid rendition of 'White Plastic Poets' and Pink Floyds 'Fat Old Sun.' It was then we realised how loud we actually were, in that Lee and Vic's room was at the front of the rather large hotel and Kilroys and James' was the next floor up, at the very rear of the hotel! The next day was supposed to see us perform at the Exotic Rock Festival in Tintagel, something we were looking forward to, and the whole reason for the trip, however a few days prior to us leaving we learnt that the festival had fallen through, so we decided to finish our little trip with a day chilling on the beach, checking out a few local bands and then finishing off with a very pleasant meal at a restaurant situated on the waters edge in St Ives. However the old saying of what goes around comes around was very much in evidence. Because we couldn't smoke in the restaurant we had to go outside, and as if it was a gift from the gods (quite literally) a bird crapped all down Lee's shoulder just before we had to go in and sit down to eat! He put the carpet bombing down to bad Karma from the car incident! Back at the hotel we had one last jam in the hotel bar, with Carl joining us this time on his newly acquired African bongo's, everything was grand and a good time was had by all! All in all it¹s been a busy time for the band over the last couple of months. We've just finished all our summer gigs and festivals culminating at yet another great show at this years Ads Rock Festival in Stockport which was held over the August Bank Holiday. It's the 3rd year we¹ve played the festival and every year it gets better, even the rain held off and the sun shone. To say the whole band was slightly hung over is putting it mildly. We'd spent the previous day at Carl and Liz's wedding which turned out to be a marvellous day (a few select pics will be posted a.s.a.p.) As for the festival we really enjoyed our set and the audience as always were very supportive, a big thanks to Darren and Angela for all their time and organisation and for having us perform again, fingers crossed they'll have us back next year! The festival gave us a chance to air a new song (it's live debut in fact) a song called the 'Shape I'm In', which we will be recording for our debut album. Although we've made numerous recording's in the past we have always been restricted to E.P's (3 or 4 tracks), this time however we plan on putting a complete album of around 10-12 tracks together. As we're finishing the writing, demo's are being recorded which will be used as outlines for when we start the album around the beginning of November. Again we will be using The Shed and our good friend John Slater to make the album, we've worked with John alot in the past and are looking forward to putting down what we think will be our best work yet! Due to the amount of time we will be spending on the record we've reduced the amount of gigs we will be playing so we can fit everything in, but don't worry we're still doing at least a couple of shows a month in the run up to Christmas. The album will hopefully be finished in the New Year, so we'll keep you up to date with how it's coming together over the next few months. Our next gig will see us perform at the Albert Halls (October 14th) with Wishbone Ash, a gig we've been looking forward to for quite a while, especially Lee as they are one of his favourite bands. We hope to see a few familiar faces there, and if you see us lurking around, don't be shy, come over for a chat we don't bite! Anyhow keep checking the site for regular updates, gigs and info etc, as always we look forward to seeing you out there! Just a quick update! Hope you all like the new website (not bad eh!) Big thanks to Stuart for putting the whole thing together! One thing to clear up is the bass player situation, a few people confused as to whats going on. Well we're happy to announce that Lee is back playing with the band full time. After coming in to cover recent gigs, everybody really got into playing together again, and we all enjoyed it so much we decided between us to make it a permanent arrangement! The band would like to thank everybody who came to see us perform at The Witchwood with Medicine Hat, it was a great evening (in our minds our best performance at The Witchwood to date!) and your support was really appreciated. Also a thanks to Medicine Hat for lining the gig up for us, they played a blinder and hopefully we'll get to perform with them again later this year! A couple of photos taken after the gig are posted on Medicine Hats website, everybody in good spirits and downing good spirits was the close to a great evening! Also on the gig front, a thanks to the fantastic support and audience we played to at The Ramsbottom R&B Festival. Aside from some technical complications (guitars giving up the ghost, then spluttering back to life), it was a great evening and the band really enjoyed the set, thanks to Chris for having us on board. Hopefully we¹ll be back next year! Anyway that's it, we've got some great gigs coming up (check the previous update below and Gig Guide for details) and we look forward to seeing you out there! Thanks S.S.R. Time to update you all on what we're up to! All the writing the band started in March is already being worked up and finished between us and will start being performed over upcoming gigs. We are also looking to get back in the studio September/October time to record new tracks. The new material will see the band going into a heavier progressive direction, with some new songs clocking in at around 10 minutes! We hope to take these new songs as well as some previous recordings and create S.S.R's debut album for release early next year. Also on the news front, S.S.R. are taking over the airwaves once again thanks to those lovely people at Pure radio! As you may know we did an interview for them last year as well as performing a live acoustic track (all this can be heard on the downloads page). Well this time we were asked to take over and present the show ourselves for a half-hour or so (radio 1 and MTV beckons, maybe we could diversify into being DJ's!!!). The idea behind us presenting the show was so we could get a lot more songs aired as well as giving you guys more insight into the band and the influences that drive us. Again we recorded more acoustic tracks live in the studio, Letting go (from the Tangents EP) and a new song Comanche Rules. As well as these, the complete studio recording of One Day Soon (from S.S.R. 3) and tracks we chose performed by Led Zeppelin, Dream Theatre and Loreena McKennitt will be aired. The show goes out in early June, so when we have a confirmed date and time we¹ll let you know. But if you do miss it don¹t worry we¹ll have it uploaded on the site when we get a copy, and also the long awaited BBC interview we did late last year. Our latest gig at the Lime Light with Jump was a real success, it's a great venue, one we look forward to playing there again, however some lessons where definitely learnt that day! We arrived at the venue early thinking we could go out for something to eat before the gig, not a difficult thing you'd think, apart from there being nowhere open at all, even the pubs aren't open on a Sunday in Crewe! We trawled around for an hour or so, even McDonalds was closed!!! We ended up going back to the venue only to realise that the only place which does food is the Limelight! It's our fault, being in a band we should have followed the long time tradition of going to the nearest motorway services to eat, but no, trying to be civilised (well actually wanting a pint with our food) we thought we'd go for a proper meal, never again, it's greasy spoons all the way from now on! As for the gig it went great, the audience were fantastic and very supportive. We thought Jump played a great set, this time playing with a full compliment of players, who were all on form. We hope to line up some more gigs with Jump in the near future, we'll keep you posted! Also out of the LimeLight gig we met a certain Mr Rob Leighton from Radio Caroline who offered to give us some airplay over the upcoming months on his show Imagination. Apparently the show is broadcast across Europe, Africa, and Asia as well as world-wide on the internet so S.S.R. will be aired across the globe, not bad eh! All in all a good evenings work! After the cancellation of our gig in April with Wishbone Ash, we're happy to announce a new date, although not until October, we've been asked to support them at The Albert Hall (Bolton), details are on the gig list. Also on the gig front we've lined up a set at another festival in July. This years Manor Park Festival (Glossop) will see the band perform on Sunday 4th July, our performance will be around midday. The festival runs over the whole weekend, featuring mainly bands from around the Glossop area, you might say it¹s a local festival for local people (well not really, everybody's welcome) and we hope to see you there! Upcoming gigs that we're looking forward to will see us play The Witchwood with Medicine Hat (June 12th), The Ramsbottom International R&B Festival (June 20th) as well as our trip down to Cornwall for The Exotic Rock Festival (July 17th/18th), and while we're down there we thought we'd play another gig at a great venue in Camborne, Tyacks (17th June). All in all it¹s shaping up to be a great summer, more gigs and info are being added all the time so keep checking back for all the latest updates. As always if you need any info on gigs or the band etc, drop us an e-mail and we'll do our best to help you out. We look forward to seeing you at the gigs; thanks for your continued support and we'll see you out there! As some of you may know over the previous months S.S.R. have been without a full time bass player, having the bands original bass player Tim Payne depping, unfortunately due to other commitments he will no longer be able to carry on covering for us. This has presented us with a slight problem, but fortunately our previous bassist Lee Buckle has managed to cover the gigs, fitting us in between his own band. So fortunately all gigs for the foreseeable are going ahead, Alleluia! This brings me to my next point Bass Player Required', if you know of anyone who would fit the band, or are a bass player yourself email us and let us know. We're looking for someone experienced, versatile with gear and transport, age 20-30. Influences hard/progressive rock, blues and folk. Anyway besides all that it's that time of the year when everyone's organising this summers big events, and of course we wanted to get involved in as many as possible! Another festival, it's inaugural year in fact, will be The Ramsbottom International R&B Festival (we're not talking booty shaking Beyonce R&B, we're talking rhythm and blues...!) We've confirmed our set for Sunday 20th June at The Grants Arms Hotel (one of four different venues hosting the festival) at around 6:45p.m. The festival will see artists from all over Europe and America as well as the U.K. coming together to celebrate all things blue! We're very happy to announce being asked to perform at The Exotic Rock Festival in Cornwall later this year. The festival features mainly original progressive and folk rock bands from all over the country coming together to perform at Tintagel (home of King Arthur apparently). More details will be forwarded as and when we know ourselves, but I can confirm the festival will take place over the 17th & 18th of July at The Camelot Castle Hotel. Other upcoming gigs will see us return to The Witchwood with Medicine Hat, another support with Jump, this time at The Limelight, Crewe and a new venue for us, The Bradford Rio. As well as these a return to The Thatched House in April, it's a favourite venue of ours, but it's been around 6 months since we've played there, shows you how time fly's, it feels more like 6 weeks! Unfortunately we've just been informed the gig with Wishbone Ash in Nottingham has been cancelled, this is due to problems at there end so there's not a lot we can do about it, hopefully something else can be arranged later in the year. Dates and times of all these gigs and more are on the gig list, if you need any further info email us and as always we'll do our best to answer all your questions. We look forward to seeing you at the gigs and again thanks for your continued support. Hi, just a quick update to start the year off! The last few gigs of the year for the band were really great, we played some of our favourite venues and played to some great audiences. A stand out gig for us was our second appearance supporting Budgie at The Sheffield Boardwalk. Although we had to cut our set slightly short due to a second support band playing, local outfit Ravenscar (who were great by the way! ), we just concentrated everything into our set and went hell for leather! The audience were fantastic and we seemed to make a lot of new fans that evening, selling a fare few C.D's and T'shirts in the process, all in all a very productive evening! We're back at The Sheffield Boardwalk on the 31st January, check the gig list for details. More dates for this year are being booked as we speak, we're trying to concentrate on the bigger gigs and supports this year, and as soon as dates have been confirmed we'll let you know! The supports that have been confirmed are The Sabbath at the Boardwalk, Adam Bomb at the Witchwood (early February) as well as Deepest Purple (end of February), Wishbone Ash at the Rescue Rooms in Nottingham and another support with Jump at The Limelight in Crewe later on in the year. We've played with both the last two bands before and are looking forward to supporting them again! More gigs will be added throughout the year, so keep checking the site out. Other things we have lined up will include us going back into the studio to record some new material, we've not got exact dates yet, we'll have to work it around the gigs. This time we want to lay down some really heavy songs, probably heavier than we've done previously, and in complete contrast to last years acoustic E.P. Tangents, but also some numbers that cross over from the acoustic feel to the heavy side of things, at the moment we're still writing and pulling ideas together, so it's all a bit vague, we'll have to wait and see! Anyway keep checking out the site for constant updates, as soon as we know anything ,we'll let you know! We look forward to seeing you guys throughout the year, so it's bye for now! Congratulations to Michael for taking 3rd place in the Academy of Contemporary Music Riffathon Guitarist of the Year. He finally got to meet and chat to one of his all time favourite guitar players, Jimmy Page! As well as Jimmy, Brian May made a special guest appearance, to take part in the judging. 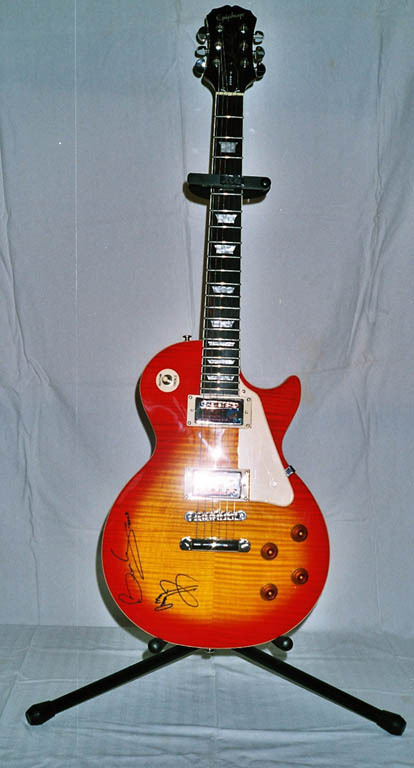 He took away with him a very nice Les Paul guitar which he got both Jimmy and Brian to sign, the guitar is now residing on a wall in his house. Michael says of meeting the two guitar heroes that they were really down to earth guys, and the whole thing was a bit surreal to say the least. There should be a special feature on the event in Guitarist Magazine, either February or March's edition!